The French oil major is to deeply cut investment in US shale and dramatically reduce North Sea field expansion in the UK as the oil price plunges, its CEO said at the Davos forum. “We have fields on the US East Coast and my instructions have been pretty clear – we will limit investments,” Total CEO Patrick Pouyanne said at a panel at the World Economic Forum in Davos, Switzerland. The head of the oil giant said he will return investments to those areas in one year when oil prices come back. 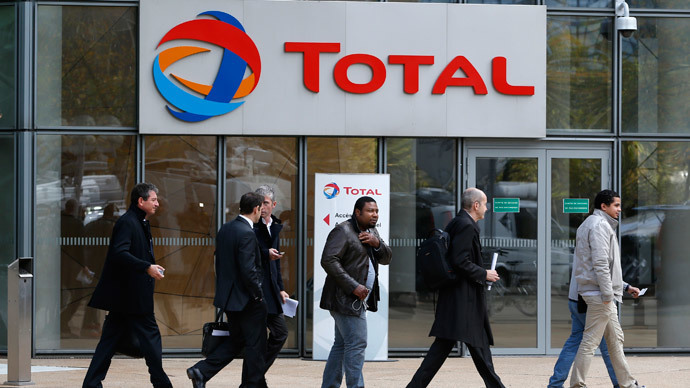 On Tuesday, Pouyanne told the Financial Times that Total will cut spending by 10 percent in 2015 and may even introduce a hiring freeze. Oil companies across the world are facing decisions like Total’s, whether extractions are “worth it” with such low prices, especially more complex projects like Arctic exploration and shale technology. “Given the current prices in oil markets, we’ll see less investments in new oil production,” Wilhelm Middellkoop, a financial journalist, told RT. Goldman Sachs has said that in order for shale to remain profitable, prices have to stay above $40 per barrel. Last week they dipped to $45 per barrel. Forecasts for oil prices in 2015 vary from $30 to $60. “We have fields on the US East Coast and my instructions have been pretty clear – we will limit investments,” Pouyanne said. The increased production from the US, as well as other oil-producing countries, has led to a supply glut, which was left unchanged after OPEC decided to keep production at status quo. Many analysts have speculated Saudi Arabia is trying to price out high-cost production like shale. “There is a natural decline of five per cent a year from existing fields around the world. That means (that) by 2030 more than half of the existing global oil production will disappear. There is an enormous amount of money that needs to be invested to get another 50 million barrels per day of new production," the CEO said.